Brigadier General Frank K. Everest Jr. This cemetery was used through the 1930s, and had become a paupers’ burial ground. 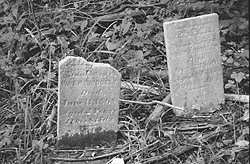 The Fairmont City Cemetery Restoration Project was begun in 2000, and has reclaimed about one-quarter of the two acre site from neglect and overgrowth. Work is continuing, engaging students from West Virginia University and Fairmont State College in Service Learning. An historic reclamation is ongoing as well. Who is interred here? What was their occupation? What is known of their life and death? What did they accomplish while alive? What is known of their family? Is their family still living in Fairmont? Its earliest grave is thought to be that of John Manley, interred 1818. This transcription is a complete work up to 2002 which was done by physical inventory, with references from previous transcriptions done by the DAR in 1934 and the WPA in 1939. It contains all known stones at this time, some stones have not been recovered, not all stones have been listed in previous transcriptions, i.e. were discovered during physical reclamation. The origninal home was built on the Farms in 1817 by Coal Baron James Otis Watson and was replaced in 1865 by a three story brick home which included a garret and a cupola. (The home is still occupied} The brick was from the Maxwell Fleming brickyard. There were many other buildings on farm including barns, a smithy (where the former slaves had lived), smokehouse, wash house, cellarhouse, a granary lime kiln and a maple sugar camp. During the Civil War James Otis Watson and his partner, Governor Frances H. Pierpont, supplied horses to the Union Army. In the 1880s the first telephone was connected between the home and the home of his son-in-law, Governor A. B. Fleming. This is where the coal company offices were then located and the Gaston Mine. As Fairmont began to enlarge in 1892, a new avenue - Fairmont Avenue - was opened up replacing the Beverly Turnpike. After his death in 1902, his youngest son, Clarence Wayland Watson, later a U.S. Senator, remodeled La Grange into a showplace and war renamed the Fairmont Farms. A greenouse and large vetable garden was used for experments in Hyordization. New stables were created where Senator Watson maintained his world Champion horse, Lord Baltimore, and such prixe winners as Kitty and My Maryland, that were exhibited in America & Europe. Horse shows were held at the Farms where blue blooded horses from all over the world. Upon Clarence Watson's death in 1940, Fairmont Farms passed out of the family. The property became a gracious sub-division of Fairmont. Many of the homes still there in Fairmont Farms are from the orginial buildings of the farm including that of the horse trainer, gatekeeper, farm supervior and the stables. Also is the original log cabin built around 1817 in the Farms. As one of West Virginia's most unique living history museums, Pricketts Fort invites visitors to relive the pioneering spirit of Captain Jacob Prickett and his family. Prickett's Fort State Park uses a living history style of interpretation to preserve, document and exhibit the past. It features an 18th century recreation of the original Pricketts Fort which provided a place of refuge from Indian attack. In addition, guests enjoy visiting the original 19th century Job Prickett House , Prickett Cemetery, Visitor Center, and Museum Gift Shop. WMMN is a News/Talk/Sports formatted broadcast radio station licensed to Fairmont, West Virginia, serving North-Central West Virginia. WMMN is owned and operated by Fantasia Broadcasting, Inc.
A true pioneer of radio in West Virginia is WMMN, Fairmont. In 1928, the Holt-Rowe Novelty Company of that city purchased the equipment of WEBH in Chicago. This was transported to Fairmont and set up in the Fairmont Hotel. Broadcasting from a studio on the mezzanine floor, the first program was given to the world on December 22, 1928. The two 90-foot towers on the hotel roof were a landmark. On March 21, 1935, WMMN was purchased by the Fort Industry Company of Toledo, Ohio, of which George B. Storer is president and J. H. Ryan is vice-president. The studios were moved to the station's present location at 208 Adams Street the latter part of August, 1935, and plans were made to erect a new transmitter building and tower a few miles from Fairmont, near Monongah. To climax a busy year of expansion, WMMN became affiliated with the Columbia Broadcasting System on November 1, and on December 10, 1935, permission was granted by the Federal Communications Commission to increase the station's power from 500 watts daytime and 250 watts nighttime to 1,000 watts daytime and 500 watts at night. Subsequent power increases and added facilities resulted in WMMN's Monongah transmitter building being increased in size, a new Western Electric transmitter installed, three 280-foot towers built, and day-and-night operation with a power of 5,000 watts. The coverage area of WMMN includes the central and northern part of West Virginia, along with western Pennsylvania, western Maryland, and eastern Ohio. Within this area live 1,129,400 people. However, during October, 1945, the station received mail from thirty-two states and two provinces of Canada. From a group of eleven people, the staff of WMMN has grown until today forty-six persons are employed, including the station's musicians and entertainers. The executive personnel is comprised of Stanton P. Kettler, managing director; Frank Lee, program director; Robert Hough, chief engineer; and Raymond Warden, office manager. The most outstanding feature of WMMN's operation is its live talent programming. Since 1940 more than one million pieces of mail have been received as a result of this programming, and the entertainers taking part in the various programs of the station have personally appeared before audiences totaling over three hundred thousand people. WMMN is especially proud of its educational programs, the oldest of which is presented each week by Fairmont State College. This institution has been broadcasting over the station for sixteen years. A modernly equipped studio is maintained at West Virginia University in Morgantown and programs have been carried from that point for the past eight years. The Rivesville Power Plant was built by Monongahela Power and Railway Company in 1919 and is currently operated by Allegheny Energy. Unit 5, installed in 1944 has a power output of 48 megawatts; Unit 6, installed in 1951, is 94 megawatts. The plant uses open loop cooling, drawing up to 69.8 million gallons per day of cooling water from the Monongahela River. The coal stockpile at the plant has a capacity of 50,000 tons, and coal is delivered by barge. Formerly, coal was delivered by rail. The plant is connected to the grid by 138Kv transmission lines. In the mid 1970's, this was the first commercial power plant to use fluidized bed combustion to fire its boilers. As of 2007, this power plant employed 33 people. The Hamilton Round Barn originally served as a dairy barn and was technologically significant for its impact on farming by incorporating the first electric milking machine in Marion County. Spatially, it held 20-25 cows and seven tons of hay. It operated as the Hamilton Barn for almost 30 years and then as the Porters barn for another 15 years; serving as the largest dairy barn in the area for several years. Purchased by the West Augusta Historical Society in 1983, the barn was listed on the National Register of Historic Places on July 9, 1985. The State Historic Preservation Office recognizes the barn as an outstanding example of technological application of industrial efficiency and scientific research into the world farming. Following a major restoration effort, the West August Historical Society maintains ownership of the barn, operating it as a museum. The museum holds a collection of antique farm equipment, a carriage, a sleigh, early mining tools, and other West Virginia artifacts. The Hamilton Round Barn museum is open May-September, Sundays 1:30-4:00 with additional tours by appointment and weekdays January-December. Requested donations are $2.00 for adults and $.50 for children, four-twelve. Once the site of a lumber and grist mill community, the scenic treasure of Valley Falls State Park is located only a short drive from Fairmont and Grafton. This 1,145 acre day use park hosts a variety of outdoor recreation including fishing, picnicking, kayaking, and 18 miles of hiking and mountain biking trails. The beauty of the park is enhanced by the spectacular series of foaming falls which were created by the dark, rushing waters of the Tygart Valley River and provides a boundary between Marion and Taylor counties. The prevalent rock formation known as Connoquenessing Sandstone, forms the cap of the falls over which the river plunges and swirls and appears both as ledges and huge room size boulders for over a mile down the narrow canyon floor. 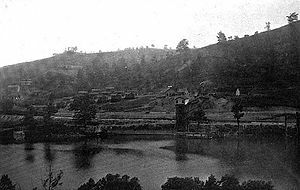 Before Valley Falls became a state park, this section of the Tygart Valley River in the 1800s was a thriving railroad community and a popular recreation area. During this "boom" period, Valley Falls had a B&O Railroad Depot Station, grist mill, post office, sawmills, shops and a ferry. Between 1886 and 1888, a fire and flood swept through the community. Some repairs were made but the town never fully recovered. 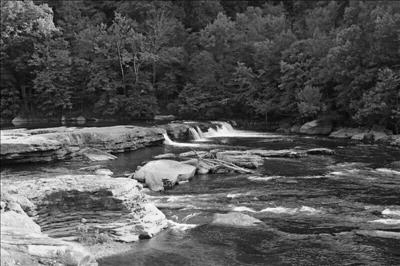 In 1964, the state park system acquired the falls and the surrounding land. This picturesque river gorge became Valley Falls State Park. Today Valley Falls State Park is a place of scenic beauty and historical significance and has continued to grow in popularity with both local and out of state visitors.